We left Flagstaff yesterday and spent the night in Albuquerque and today we will drive the rest of the way to Denver. 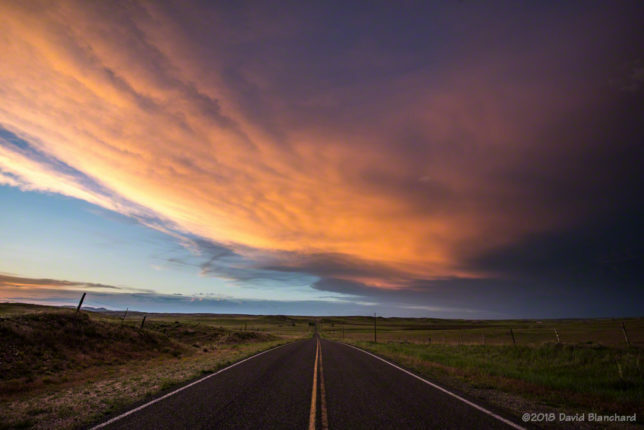 We will be spending two weeks in Denver visiting family and friends—and will do a bit of storm chasing if the right conditions present themselves. 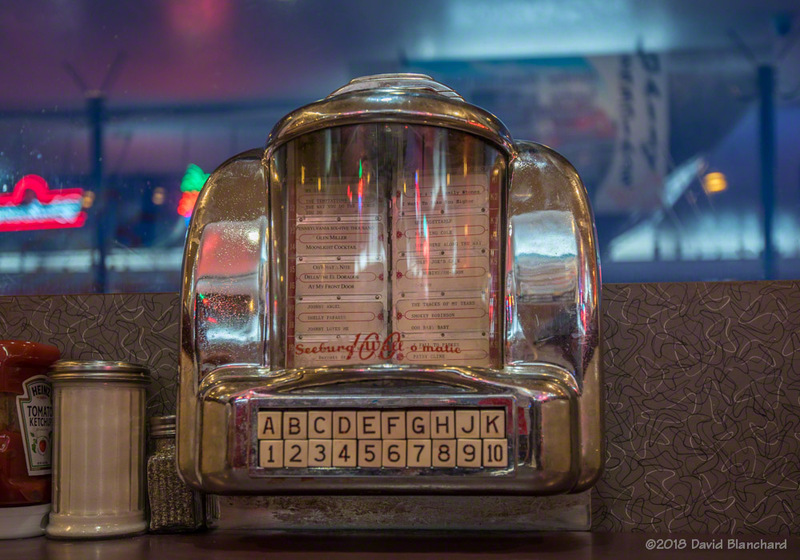 We had dinner last night at the Owl Cafe—a Route 66-style diner. 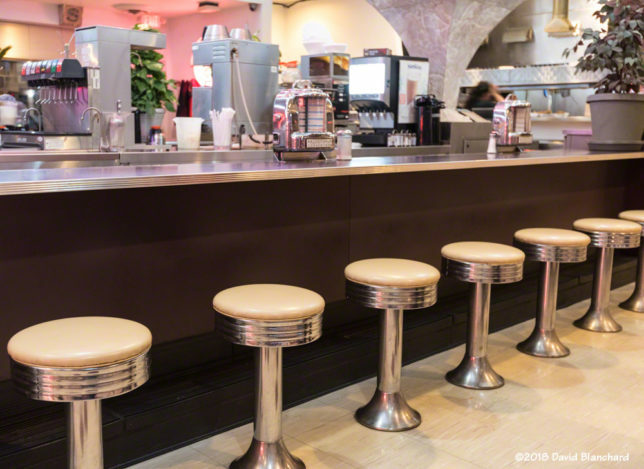 We’ve been here before and like the decor. The food isn’t too bad, either. The drive from Albuquerque to Denver was interesting as we were in a post-frontal airmass and the clouds had these abstract undulations. We stopped a few times for photos along US 84 in eastern New Mexico. Windmill and clouds in eastern New Mexico. 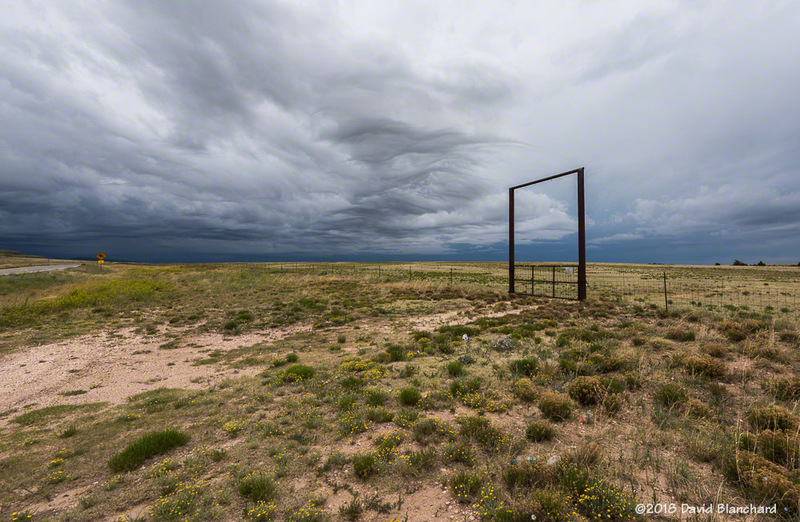 Gate and clouds in eastern New Mexico. Strong instability (1000–3000 J/kg MLCAPE-MUCAPE) prevails across the High Plains but the deep-layer shear is weak. Also, surface temperatures are very hot so evaporative cooling will probably aid downdrafts creating strong outflows. 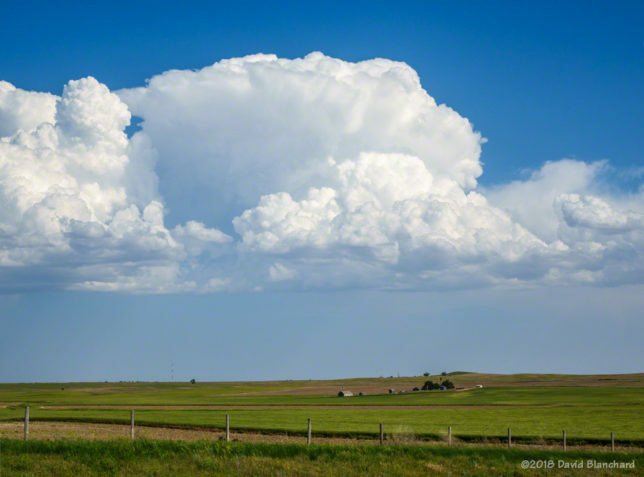 I encountered 96_100°F temperatures across northeastern Colorado while approaching an agitated cluster of cumulus clouds. This was the only target in this area. 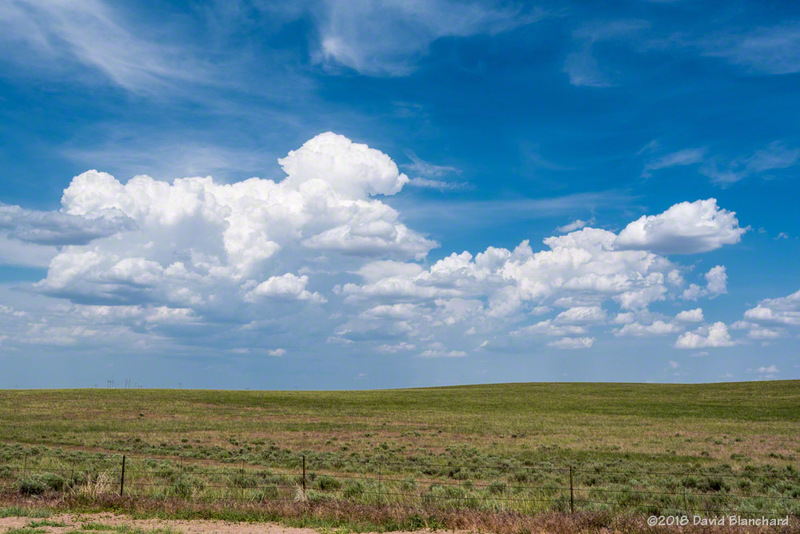 The only other area of convection at this time was back across the higher terrain of southeastern Wyoming. 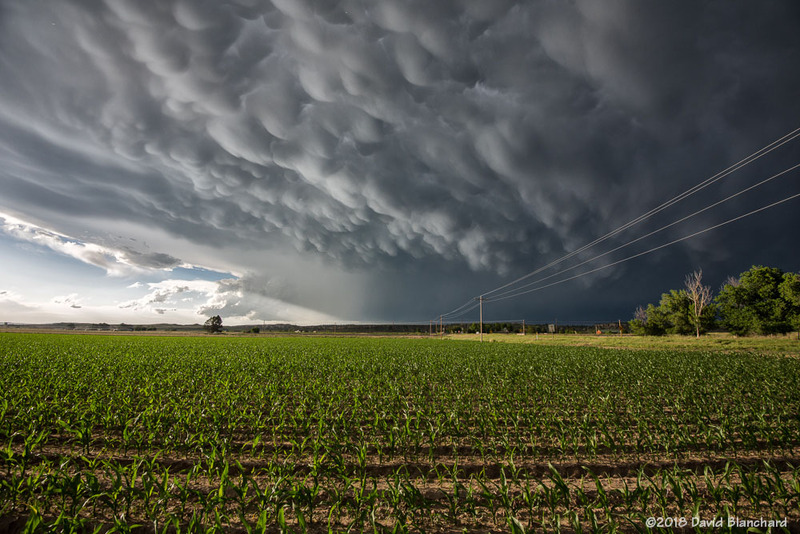 The cumulus cluster grew into a large multi-cellular thunderstorm complex near Julesberg, Colorado. 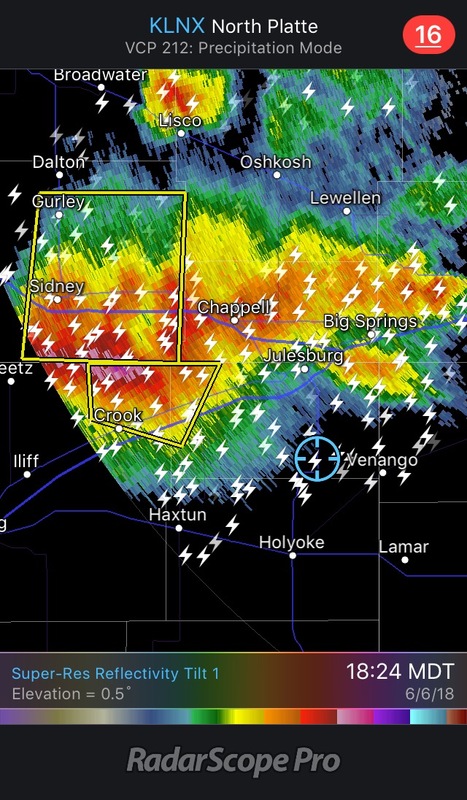 I remained in the general vicinity of Julesburg moving as necessary for better views and lightning safety. The southern end would occasionally exhibit some signs of rotation with banded mid-level structure but it was usually short lived. Lightning was prolific. It was interesting was how much lightning occurred at great distance from the storms. Anvil lightning was dropping all around me for an extended period making it unsafe to be outside and photographing. Not that there was anything interesting to photograph. And there was lots of dust. Outflow probably exceeded 40–50 mph multiple times; it may have been stronger for brief periods. 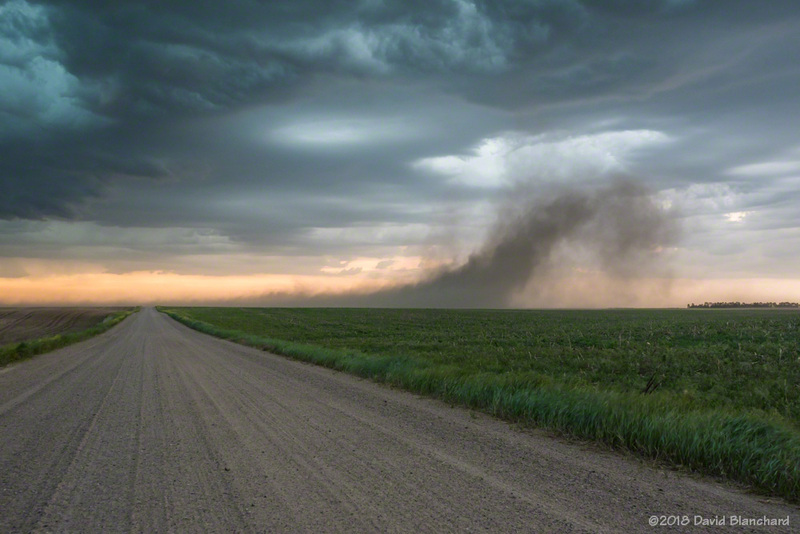 A tornado was reported northwest of Grant, Nebraska, at the same time I was west of Grant and south of Julesberg. There was a moderate precipitation core between these two locations so visual verification was not possible. However, I had been in strong northerly outflow for quite some time when the warning was issued so I would presume that Grant was also in outflow. Plus, I had observed several gustnadoes including one that could be mistaken for a tornado. Perhaps that is what the observer saw. 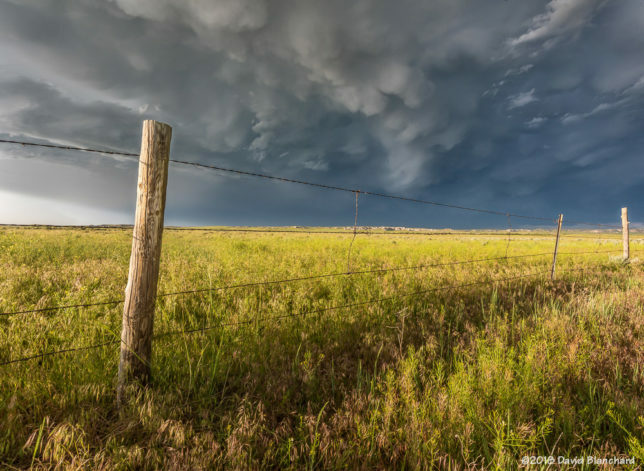 An amazing tornado occurred in the Laramie, Wyoming, area. Wish I had been there. 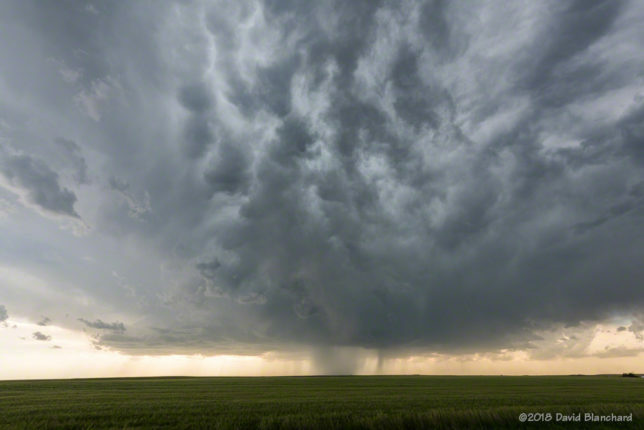 Thunderstorms develop near Chappell, Nebraska. This is the best it could do. Not very supercellular nor very photogenic. Staying southeast of the main storm cores to avoid hail. Note how far to the southeast the lightning is striking from the main storm! Strong and cold outflow surges south—and that’s the end of the storm. A fairly typical post-MCS (mesoscale convective system) air mass lies across the High Plains with southeasterlies and adequate moisture in place. 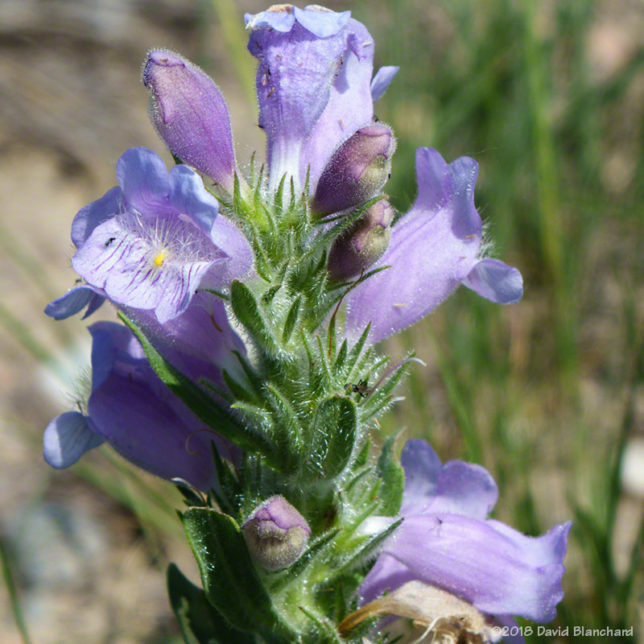 A weak northwest–southeast boundary was noted across Wyoming with southeast flow to its north and southerly flow to the south. By afternoon, this boundary had weakened and was no longer apparent in the surface data. Both shear and instability were similar to the previous day—so really just another marginal setup. Surface analysis with weak boundary. I drove west on I-80 to Cheyenne then headed north on I-25 and watched the convection slowly bubbling across the mountains to the west. I took a few photographs looking to the northwest across the Laramie Range. I decided to stop at the Dwyer Junction Rest Area for some time lapse or other photos. As I pulled into the parking lot I noticed a research radar in the lot—then I noticed the OU on the door—and then I saw Howie Bluestein. “Hello, Old Friend,” I said as I drove up. It was good to see him. 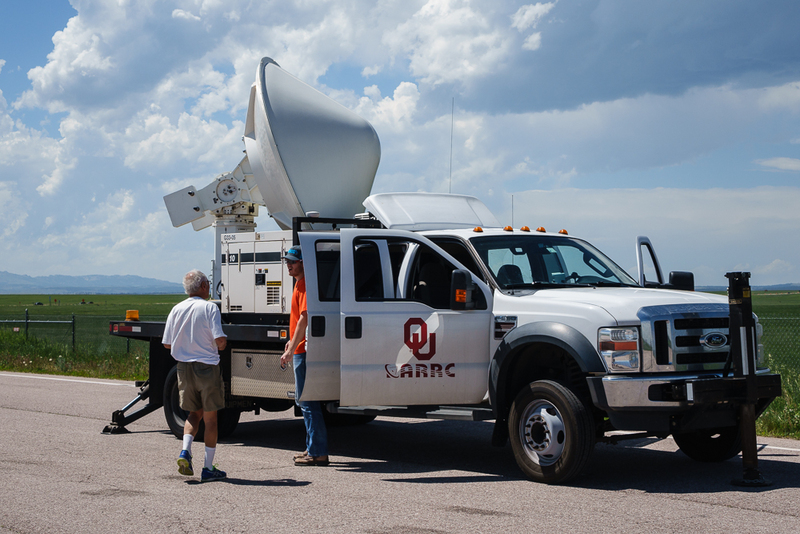 He invited me to follow them today as they attempted to collect interesting data on severe and tornadic storms. 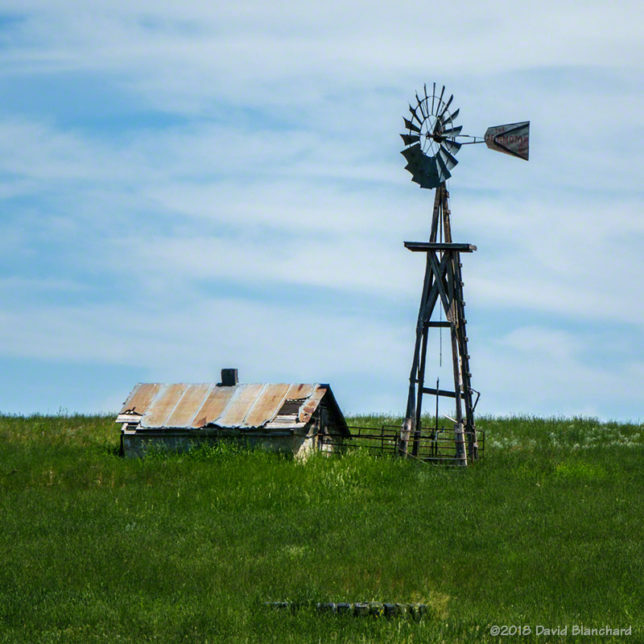 Collecting data was easy; finding a meaningful storm was not. 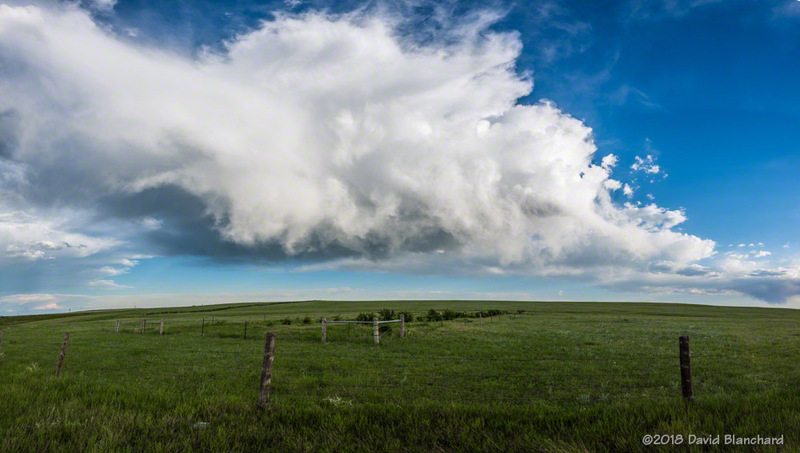 Early convection over the Laramie Range, Wyoming. University of Oklahoma research radar. Yeah—they collected data on this high-based storm. We drove to Guernsey, north to Lusk, south to Torrington, northwest to a spot west of Lingle, then to a spot north of Lingle, and finally gave up. Storms would develop over the mountains but the updrafts would collapse as they moved off the mountains. 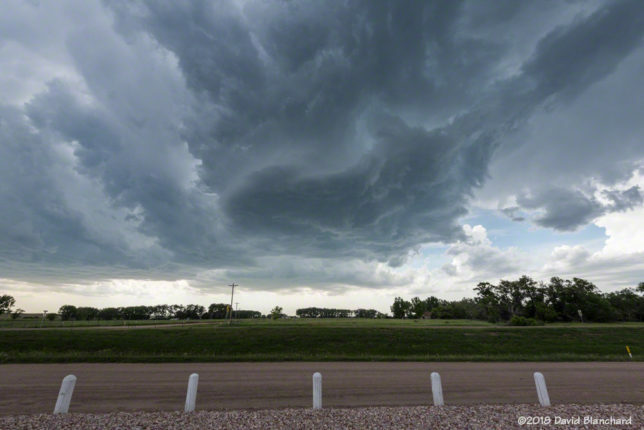 Enough precipitation and hail were lofted into the storm anvils to allow plenty of rain to fall downstream of the storm — but there was nothing severe about these. Cumulonimbus Mammatus on the trailing anvil. There was some great CbMam on this final storm but the system was moving to the east too quickly to get a good sunset shot. I tried anyway. Also too many power lines in my shots. I’m usually more careful about this but setting up in the same place as the radar meant that I got the location that they chose. 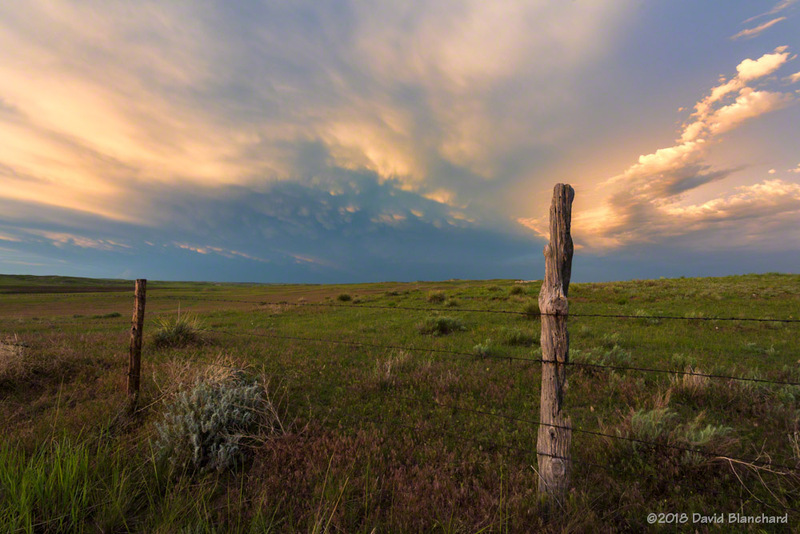 Cumulonimbus Mammatus over Wyoming grasslands. I arrived in Wheatland too late for the Mexican restaurant but Pizza Hut was open. Cheap but uninspired food. Welcome to chasing. Similar conditions to the past several days remain across the High Plains with moderate instability and weak-to-moderate shear. Because I do not need to travel far I spend the morning enjoying the scenery. 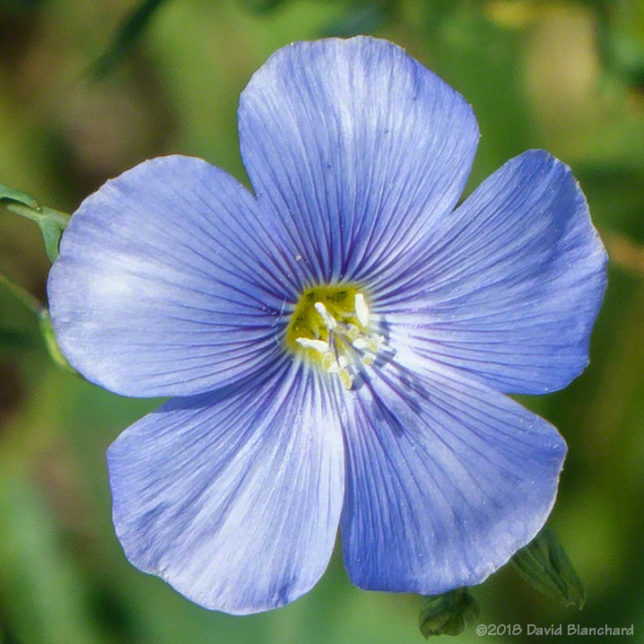 First stop is at Dwyer Junction Rest Area where I get a chance to photograph several types of wildflowers. Next, I drive to Guernsey and then north. I stop briefly in Hawk Springs hoping for some interesting photo opportunities but there isn’t much here. On to Lusk and the Rest Area for more data. Convection is slow to develop so there is time for lunch at a favorite pizza shop. Convection still has problems once it moves off the higher terrain. 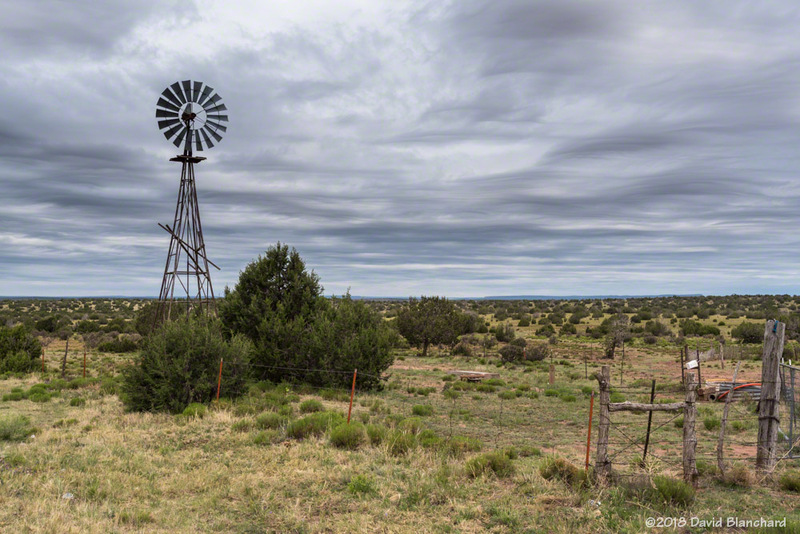 One storm seemed to be doing a little better and I left the highway at Lost Springs and drove north a few miles on the curvy dirt road until I found a good place to photograph. A rancher told me there were better views with valleys about a dozen miles up the road but that was too far since the storm was closer than that—and if it began to rain this road would be a problem. 60 minutes compressed into 12 seconds. I drove south and stopped a few miles north of Cheyenne to photograph a “virga storm” that was nearly overhead. Even with the 16mm it was too close to capture without trying for a panorama. But that resulted in some extreme distortion. An overnight MCS has pushed an outflow westward into eastern Colorado and southwestern Nebraska. I had hoped—and SPC had issued a Slight Risk—that storms would develop and move across this boundary and intensify. The storms that moved eastward from the higher terrain were moisture starved and working with inadequate shear. Not much of a storm when they moved across the boundary. Chased I-76 to CO-71 to I-80 to the Julesburg area. I was hopeful as this storm developed.